Using Apache Thrift enables us to generate client libraries for our SDK (still very-WIP) targetting a variety of languages. I’m going to create a test library for Rust that makes a simple RPC call to our background service. Note the -gen rs ... output showing calls to thrift.exe. The particulars of our platform aren’t important for this excercise. You could substitute the thrift tutorial. As a first step I want to build a rust library containing the generated source files. 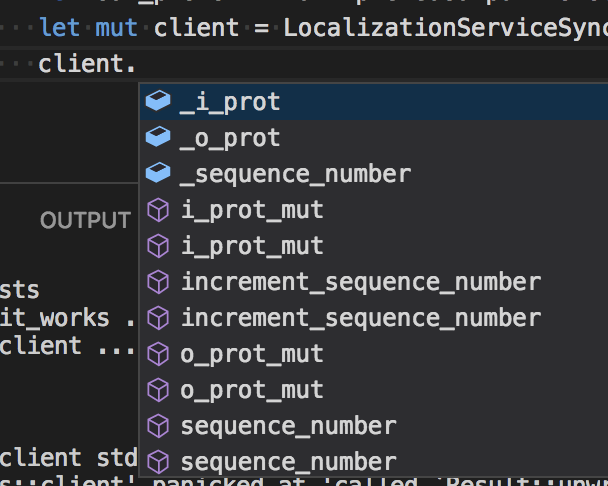 Launch Visual Studio Code and install Rust support. Open the subor/ folder cargo created. Copy all the generated .rs files into the src/ directory. Bring up the VS Code terminal with ^` (that’s Ctrl+Backtick- or “grave accent” if you’re fancy). |     ^^^^^^^^^^^^^ Did you mean `self::ordered_float`? Use glob operator (also see example with tests) to bring everything in that file into scope. Inside it_works() function type let msg = L (Note: capital “L”) and “intellisense” should suggest the rest. Finally, cargo test to run the test and it should pass. Confident we can build things, let’s make a full-fledged client so we can do RPC. // Multiple clients can be multiplexed over a single transport. // route to the correct service. Bi-directional channels like TTcpChannel implement TIoChannel::split() to create “readable” and “writable” halves. Each binary protocol can then take ownership of its own half. Wrap output protocol with TMultiplexedOutputProtocol so we can have multiple T*SyncClients that share a single TCP connection (or other transport). The first parameter, service_name, is application-defined name given to the service- here "SER_L10NSERVICE". Although not a thrift requirement, the server side of our application is expecting it. For the server-side I’m testing with our latest release of layer0. ProcessAsync() of matched processor is called. It extracts method name (GetCurrentLanguage) and matches to corresponding method. Check the names registered with TMultiplexedOutputProtocol::new() (client) and RegisterProcessor() (server) match. Overall, my experience with Rust was like my experience with F#; if it compiles, it works.